The World Poker Tour is making its first stop in the beautiful Turks and Caicos this fall and PlayersOnly.com Poker is giving players a chance to enjoy surf, sand, sun and a shot at fame and fortune at this televised WPT event. World Poker Tour Turks and Caicos Poker Classic prize packages that include travel, accommodation and a seat at the Main Event will be awarded to Super Satellite tournament winners and to leaderboard champs. Players can qualify for a seat in a Super Satellite for as little as $2. PlayersOnly.com is also rewarding its loyalty program participants by offering two free seats to players topping their Gold Card Poker Tour Leaderboard . 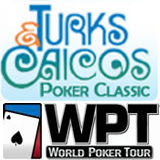 The Players' Club Turks and Caicos Poker Classic is a World Poker Tour tournament being held at the Club Med resort. The tropical islands just south of the Bahamas are where Desperate Housewives actress Eva Longoria and basketball star Tony Parker spent their honeymoon in July after their 7/7/07 wedding. Ben Affleck and Jennifer Garner got married there and Julia Roberts, Jerry Seinfeld, Barbra Streisand, Janet Jackson, Britney Spears and Justin Timberlake all love the secluded paradise. "It's important to continue delivering fresh and exciting experiences for our players and fans on both the tournament and television level," said Steve Lipscomb of the WPT. "By adding WPT stops in beautiful locations around the world season six is our best year yet." There are two ways for PlayersOnly.com players to qualify to win the prize packages: by winning the weekly Super Satellite or by playing their way to the top 100 on the Gold Card Poker Tour Leaderboard. Weekly Super Satellite’s began July 8th and continue until September 9th at 5:00 pm each Sunday. Direct buy-in for these events is $200 but players can also qualify for them at Sit & Go and multi-table cash satellites in the week leading up. Regular PO players collect Gold Cards in real money ring games. Each Gold Card is worth points on the Gold Card Poker Tour Leaderboard. The top players on that list will qualify for the playoff matches. PlayersOnly.com’s $12,000 Prize Pack includes registration in the WPT Turks & Caicos Main Event ($7700), seven nights at Club Med (Turquoise) and $1800 cash paid directly to the winner’s real money account for airfare. The PlayersOnly.com Poker Room is part of the Cake Poker network, one of the fastest growing poker networks open to American poker players. The poker room is part of PlayersOnly.com’s graphically-rich, ultra realistic casino environment hosted by model and gambling columnist Carrie Stroup. In addition to this Sunday tournament series, PlayersOnly.com is also presenting a weekly Saturday free roll series: the grand prize winner of the Fox Baseball World Series Free Roll Tournaments will win an all expense paid trip to the World Series this fall. Free roll qualifiers are held every Saturday at 3:30 pm EST – just as Fox Television broadcasts Saturday afternoon games.